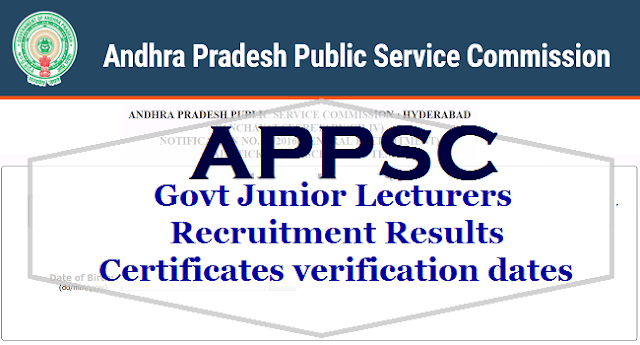 APPSC Junior Lecturers(#JLs) Chemistry Subject Economic Subject Recruitment 2008 Results, #Selectionlist 2017/ Junior Lecturer's Economics subject- provisional selection list: APPSC Junior Lecturers Recruitment Results Declared(December 2011 Exam), APPSC Junior Lecturers Recruitment Results ,Certificates verification dates 2017: Andhra Pradesh Public Service Commission (APPSC) has declared the result for the written exam held for the post of Junior Lecturer in Government Junior Colleges (Economics). Candidates who have qualified the written exam have been provisionally picked by the Commission for Oral test. The results have been announced as per the revised answer key. APPSC released the final selection list for Junior Lecturers (Economics) Jobs in Government Junior Colleges on June 16th. There are 95 candidates in this list. In the 2008 advertisement, some candidates went to the APAT for the mistakes in 'key'. Following the trial, the 'key' was found to be 77 errors. Another 96 interviews were conducted recently. The Commission has released a final list of 95 new candidates based on merit in older and new candidates. 1) that success in the examination confers no right to appointment unless the appointing authority is satisfied after such enquiry as may be considered necessary that the candidate having regard to his / her character and antecedents are suitable in all respects for appointment to the service. 3) that the candidates should produce such other original certificates as may be required by the appointing authority in accordance with the Rules. 4) that the Provisional Selections are subject to outcome of Court Cases, if any. If, it comes to the notice of the Commission later that any candidate furnished false information or the selection is not in order due to any act of omission or commission of any candidate then his / her provisional selection is liable to be cancelled at any stage and he / she will forfeit all consequential benefits including that of selection, besides the Commission reserves the right to take any action as it deems fit in the circumstances of the case, in terms of the various enabling provisions as notified in Notification No. 19/2008 & 05/2008. The selections of candidates belonging to BC-E group will be subject to adjudications of the litigation pending before Hon’ble Courts including final orders in Civil Appeal No. (a) 2628-2637 of 2010 in SLP No.7388-97 of 2010 dated 25.3.2010 and orders from the Government. covered by the decision of the order of the Hon’ble APAT hence retained in the selection. Candidates are required to produce original certificates in support of their age, qualification, community and other important aspects, during interview. Document verification will be held from 1 May 2017 till 6 May 2017. It will start at 8.00 am at the above mentioned dates. Oral test (interview) will held on the same day at 10.30 am. A total of 96 candidates have been provisionally shortlisted for the oral test. 2. The candidates are required to produce the Original Certificates along with two sets of copies relating to Age (SSC), Qualifications, Community, Creamy Layer exemption certificate in case of BCs as per G.O.Ms.No. 3, BC(W) (C2) Dept. dt. 04/04/2006 (prescribed format hosted on website), Certificate relating to claim of age relaxation, Study certificate (from 4th class to 10th class) and other relevant certificates at the time of verification of documents, failing which, they will not be admitted for interview. No extension of time will be given for production of original certificates for any reason, whatsoever. 01/05/2017 to 06/05/2017. Only eligible candidates will be called for the Oral Test(Interview) to be held at 10.30AM on the same day. The Interview schedule will be placed in the Website separately. The candidates should download the Interview Call letter (Memo), Check lists, Attestation Forms and other relevant forms from the Commission’s website www.psc.ap.gov.in from 19/04/2017 and should submit at the time of Oral Test.